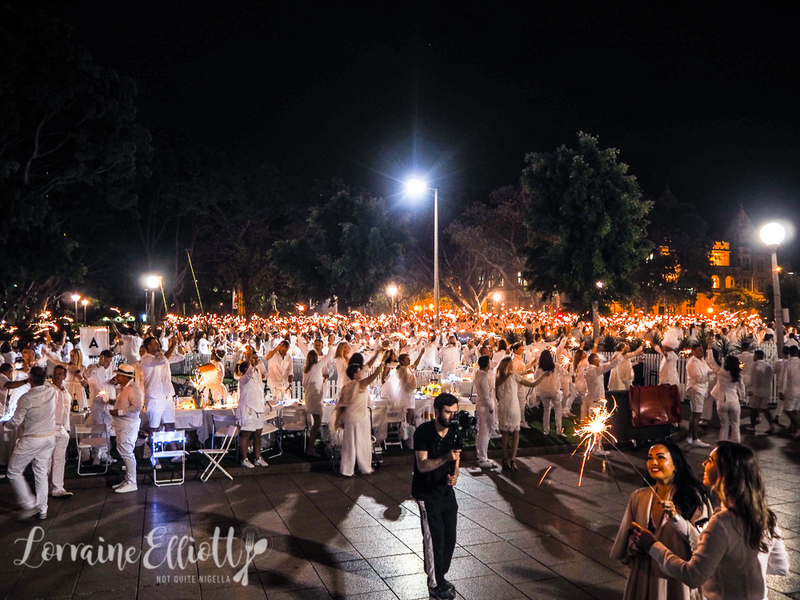 Le Dîner En Blanc is back! 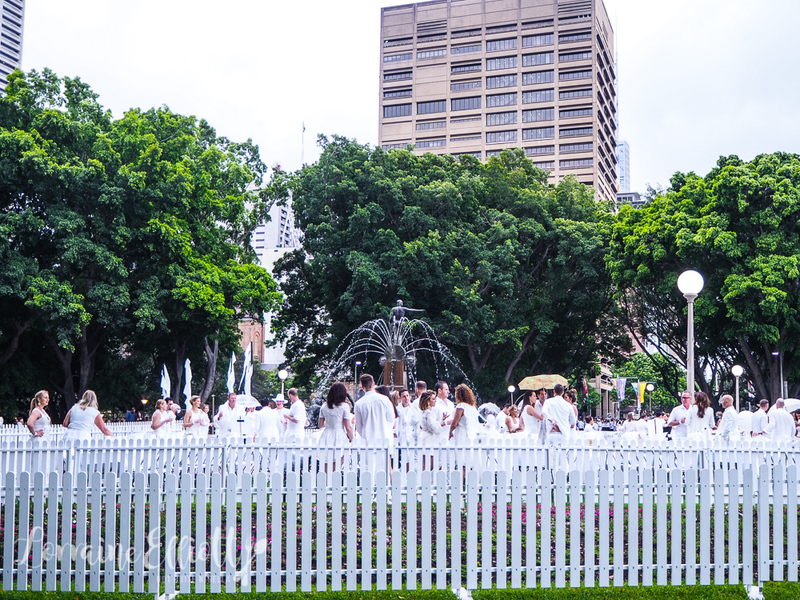 The all white picnic party with a surprise address has been running in Sydney for 7 years. On one night in November thousands of picnickers descend before nightfall at one location. 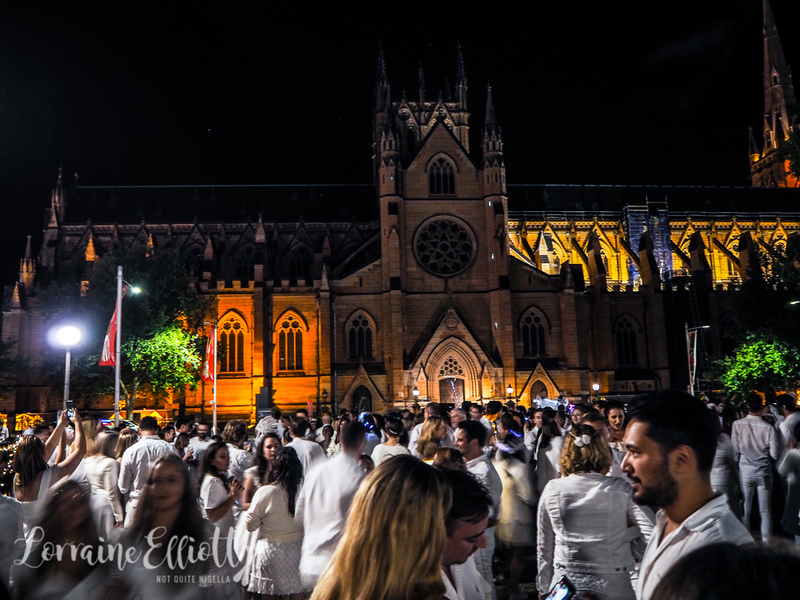 So where was this year's Diner en Blanc held? 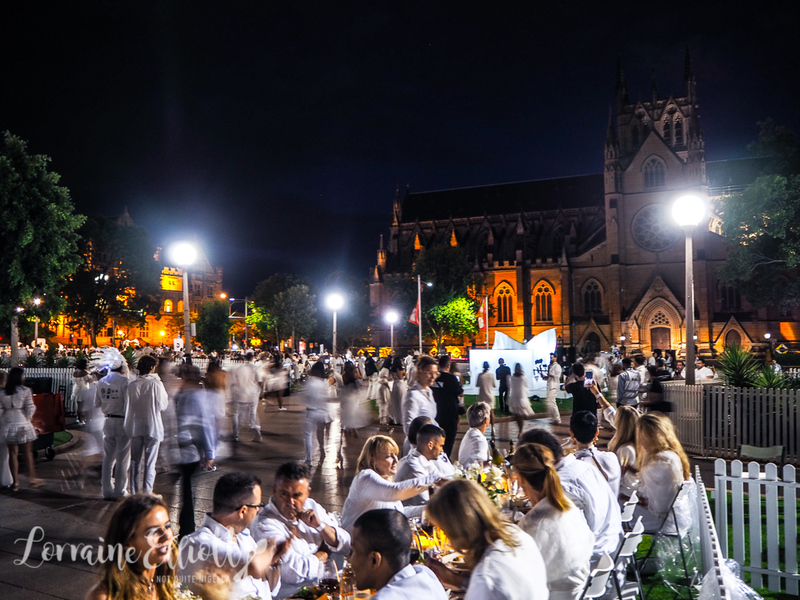 Dîner en Blanc started in 1988 by François Pasquier who wanted to set up a rendezvous with friends for a picnic in the Bois de Boulogne park in Paris. He asked that everyone wear white so they could find each other. 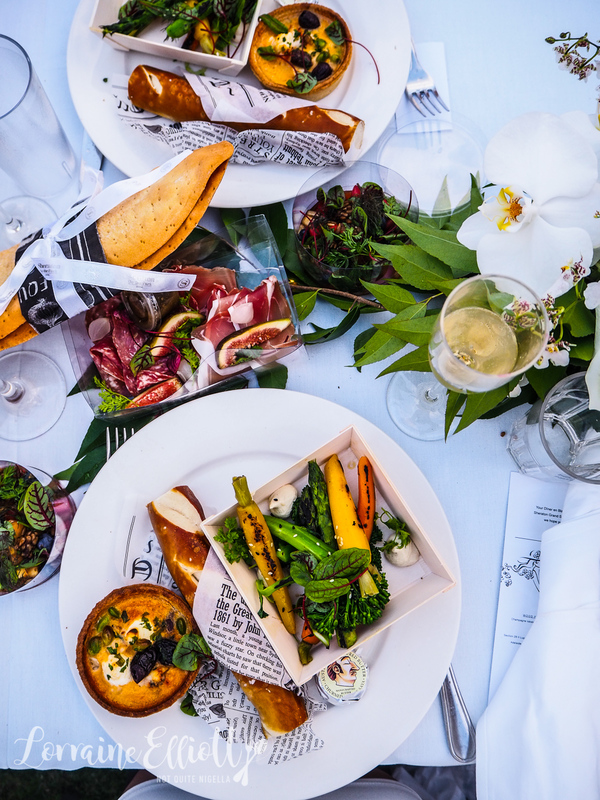 Since then these outdoor picnic events are held in more than 70 cities worldwide spanning across 6 continents. Mr NQN and I are in an Uber on the way to the ‘Sheraton Grand Sydney Hyde Park hotel in the city. This is our rendezvous point for the start of our Dîner en Blanc experience. 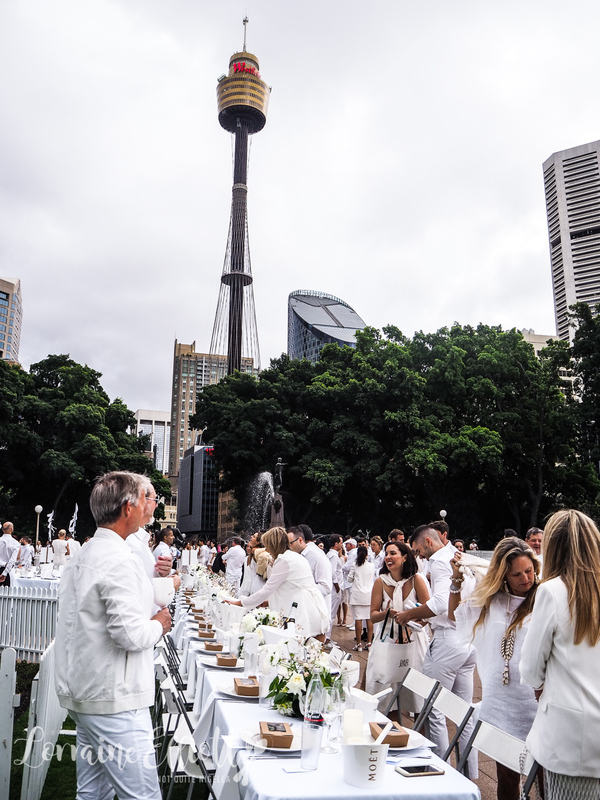 We are lucky enough to be joining the Marriott International table who are major sponsor of Dîner en Blanc for the second year in a row. In one of the ballrooms we look out the window at Hyde Park down below. "There is a lot of white out there," he says pointing at the Northern end of Hyde Park. 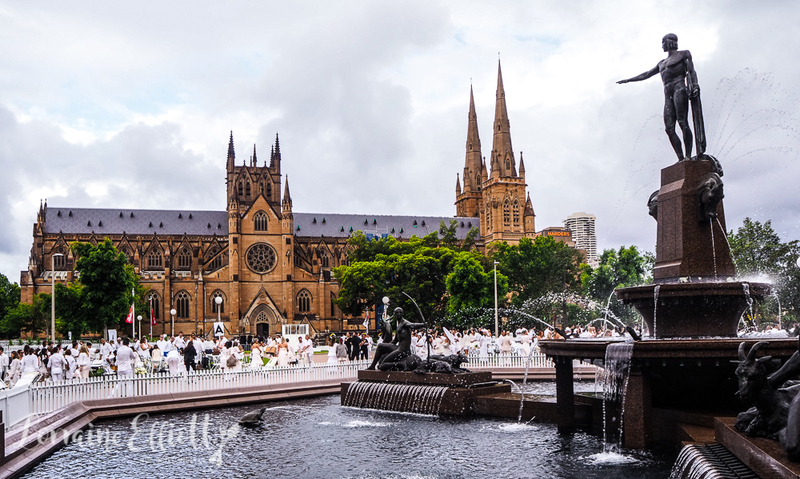 And a little later they confirm the location to us: just across the road near the fountain in Sydney's Hyde Park! At 5:30pm we make our way across the road. 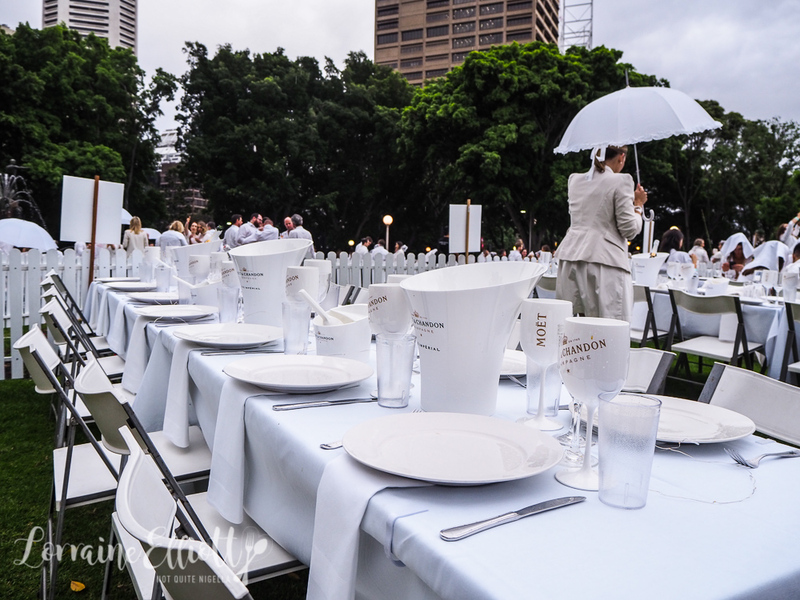 The scene is awash with white tables and tablecloths aplenty as people are busy setting everything up for their dinner. 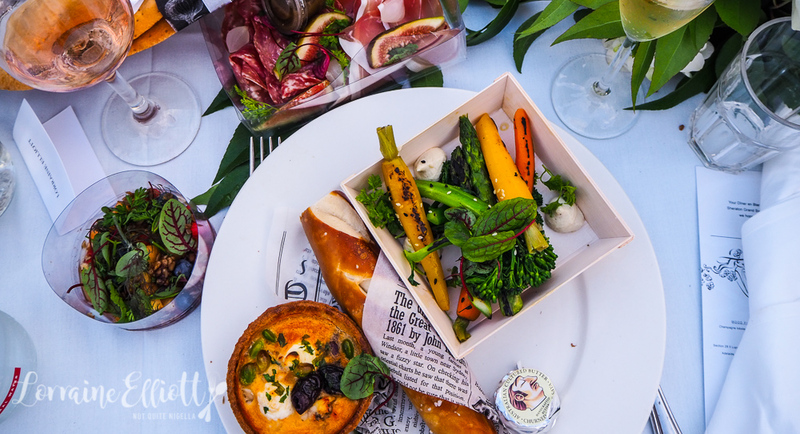 People can either bring their own food or pre-order food hampers from the event's catering team and hampers range from $110-$145 per person. Alcohol must be purchased and can be either pre-ordered or bought on the night. Diners are also specifically told to bring specific sized tables must dress them with white tablecloths while chairs must be white or covered with white cloth. We notice that some tables have gone even further fancying up their tables and there are dining groups with canopies and ones with clear balloons. No drinking bottles or glass is allowed either and everything must be polycarbonate (although china plates are permitted) and that includes bottles of water so they supply free water. There are scrupulous bag checks to ensure that people don't bring alcohol in. Entry is staggered and the group must present all at once to enter. While the Dîner en Blanc's ethos is "Leave no trace" aka clean up after yourself, many people do unfortunately leave behind furniture. An idea would be to add a small tariff or deposit to the entry fee of $62 and provide tables and chairs that are then returned to a rental place because at the end, the amount of waste can be heart breaking. After mingling with our fellow guests and a slight detour where we move under the shelter of the nearby trees to avoid a light sprinkle of rain, the night clears and it's a beautiful night. 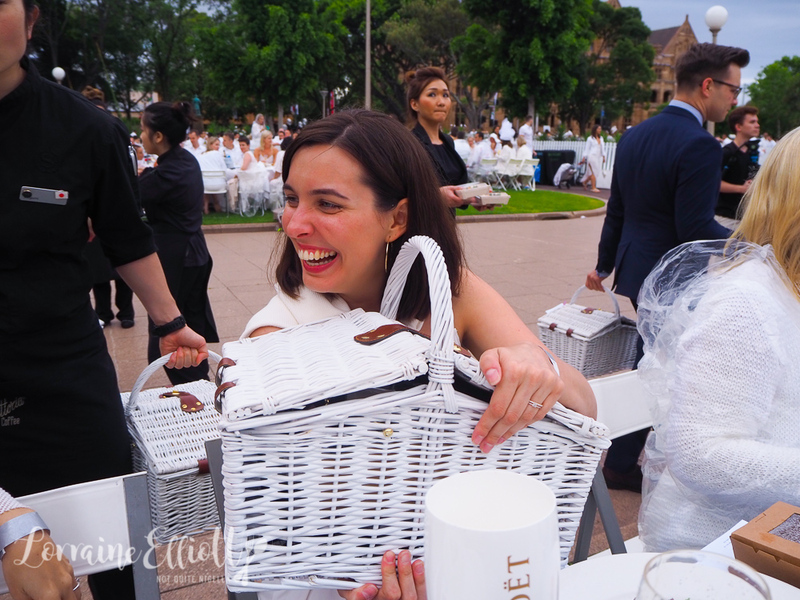 The food for our table is provided by the Sheraton Grand Sydney Hyde Park Hotel and the staff show up promptly carrying white baskets. We plate up our first course. 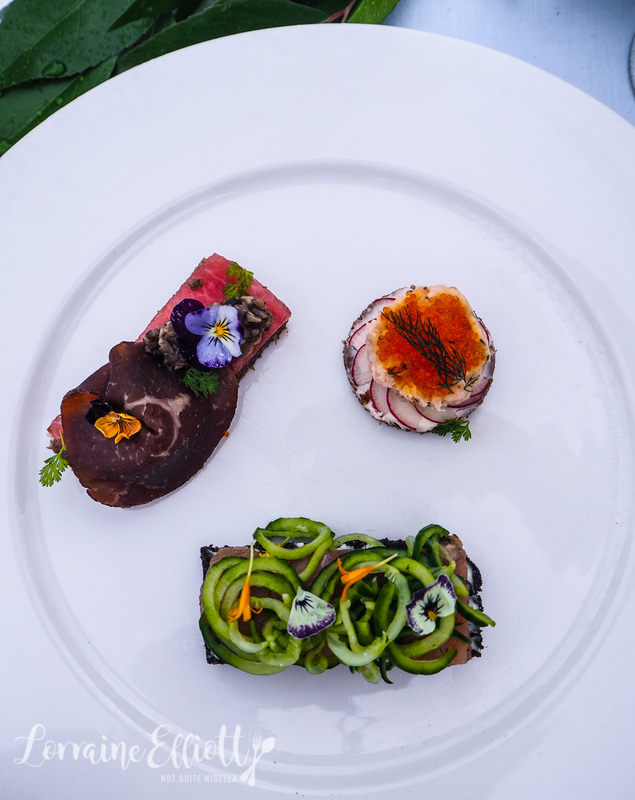 It's an assortment of canapes on pumpernickel bread. There's a wagyu bresaola with watermelon and truffle as well as a gravlax, cucumber, ricotta and fennel seed toast. My favourite is the shrimp salad with radish on multigrain. Then we open the white picnic basket where there are more boxes of goodies. The wood fire oven baked quiche is filled with a luxurious mix of champagne lobster, ricotta and black olives with a crisp, buttery shortcrust base. There's also a box of grilled heirloom carrots and broccolini with dabs of smoked tahini cream for each of us. Then to share there is a charcuterie selection including 18 month Cullatta Villani ham and Vicentina Sopressa and a Billinudgel green mojo sauce as well as house baked pretzel bread batons and Brasserie Bread pane croccante with Pepe Saya butter. There's also a fruity spring salad with melon, bronze fennel, sorrel, seeds and an apple balsamic dressing that's a bit savoury and sweet at the same time. 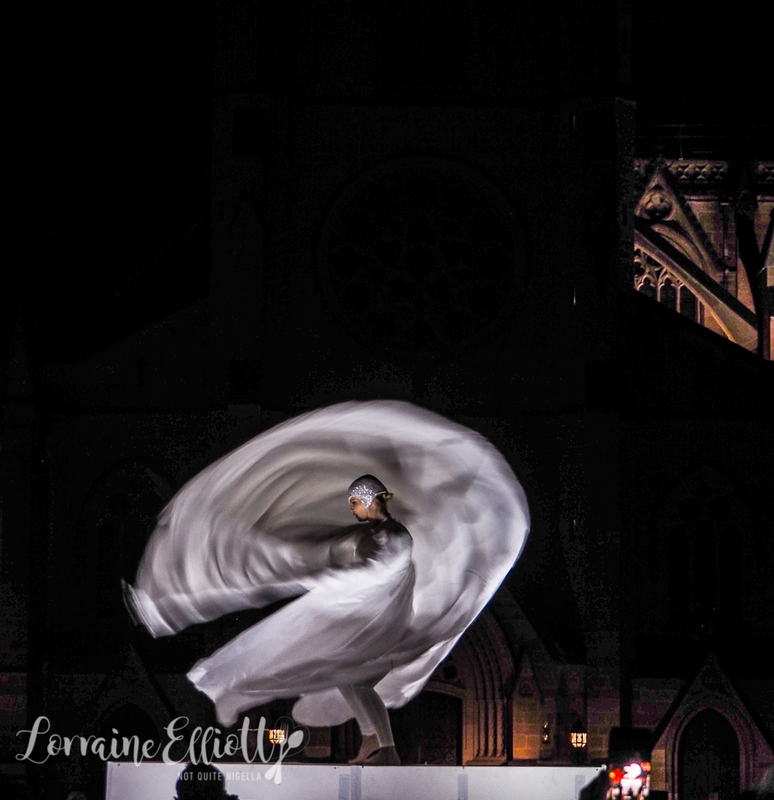 There are two group events at every Le Diner En Blanc and the first is the white napkin twirling that commences around 7pm. This makes for some great photos. Suddenly, everyone gets up and twirls their napkins and clinks glasses. Then we lay out dessert. 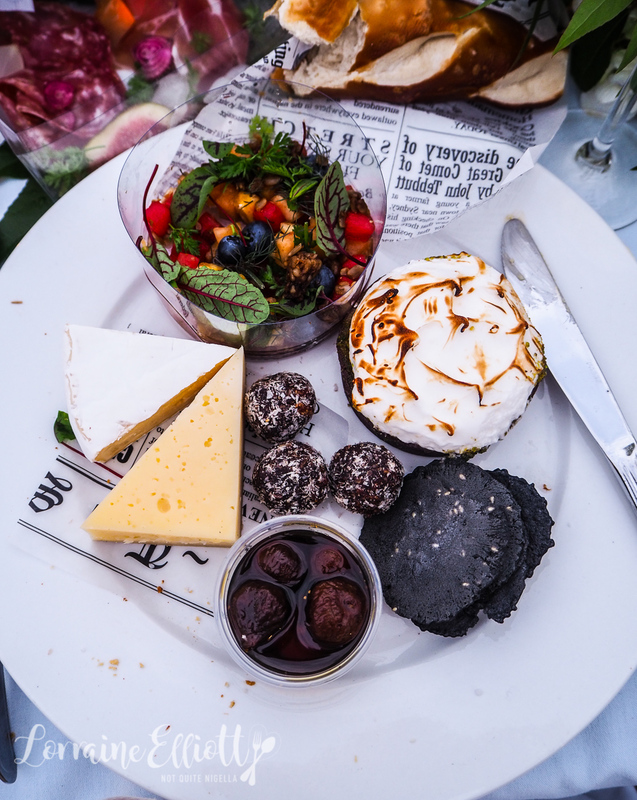 There are two cheeses: a Section 28 Il Lupo semi soft cows milk cheese from Victoria and an Adelaide Hills double cream brie as well as charcoal crackers and spiced dried baby figs. My favourite sweet bite however is the lemon meringue tart from Meander Valley Dairy in Tasmania but if you're feeling healthy there are also coconut dusted chocolate bliss balls! Then later come the second group activity that comes out once night falls. They pass out long sparklers and everyone is supposed to wait to light them at the same time. Everyone twirls these to the music. Inevitably I find at these dinners, you'll bump into someone you know and I saw a friend Anna in the bathroom queue. Later on I feel a chin on my shoulder. It's Ivy and Louise who are sitting in another section who have popped by to say hello. We have a great night eating and enjoying the atmosphere and luckily the majority of rain stayed away! 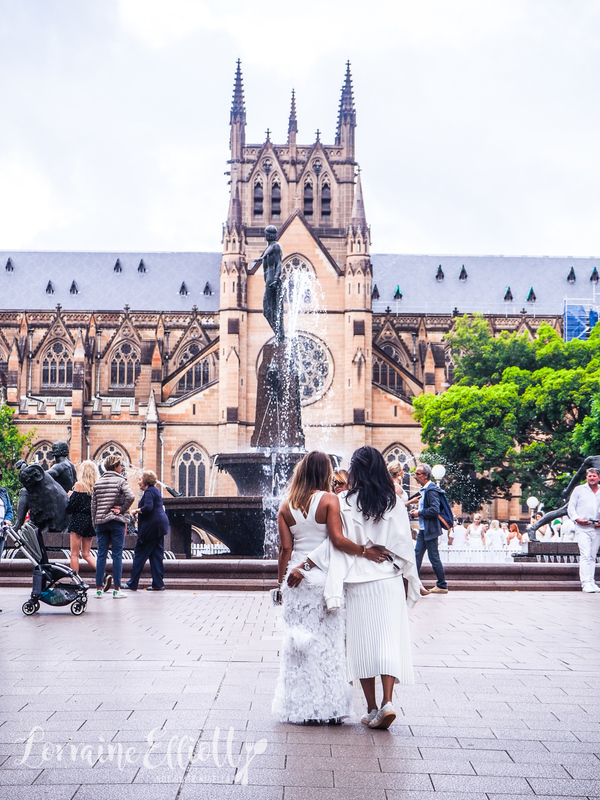 So tell me Dear Reader, have you ever been to a Diner en Blanc? What do you think of the concept? Do you like surprise events like this? NQN and Mr NQN were guests of Marriott International but all opinions remain her own.